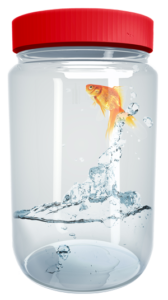 Recently, a facility operator – we’ll call him Bob – contacted us with an odd conundrum. His facility has four 1000-ton chillers – three to support the load, and one to serve as back-up in an emergency. With a total cooling load running around 2500 tons, three chillers should be more than enough, yet even with all four chillers operating, they couldn’t keep up with the load. First, he wondered whether the load is higher than he thinks it is. So, he calibrated the flow meters and the temperature sensors… multiple times. But no – the load is correct. Then he thought, “maybe the chillers aren’t working right.” So, he had the contractors and vendors check them. They seemed OK, although the pressures and temperatures weren’t exactly what was submitted, but after a lot of debate and finger-pointing, he still didn’t have any answers. Finally, he wondered if maybe the flow was too low, so he increased it. This only made things worse! To address his chiller capacity issues, all of Bob’s equipment vendors, contractors, and even his design engineer recommended the tried-and-true “more is more” approach; just add chillers – one to help meet the load, then another to be the redundant chiller. But this would be an expensive “fix.” Pumps would need to be added, piping would have to be changed, the mechanical room would have to be re-arranged, and already-constrained resources would have to manage it. He was looking at a $3 million hit. Before dropping a ton of cheddar on more equipment, Bob decided to give us a call. Our mechanical team thought that maybe the problem was speed; perhaps the water was moving through the system too quickly and needed to be slowed down. Why yes… yes it does. The term Delta T (ΔT) is the temperature difference between two points – it’s used to measure, among other things, the efficiency of a chiller system. Basically, heat moves from warm areas to cold areas; the greater the temperature difference, the faster the heat transfer. This explains why, under certain conditions, hot water freezes faster than cold water. Chilled water systems are made up of heat exchangers – chillers (the evaporator barrel) and air handlers (the cooling coils). These heat exchangers work using the same principles; higher temperature differences mean faster and more efficient heat transfer. In Engineerese, Log Mean Temperature Difference (LMTD) is a formula used to determine the efficiency of heat exchangers. It was derived from measuring various types of heat exchangers and temperature differences, and while it’s not as old as Moses, it does predate Roosevelt. 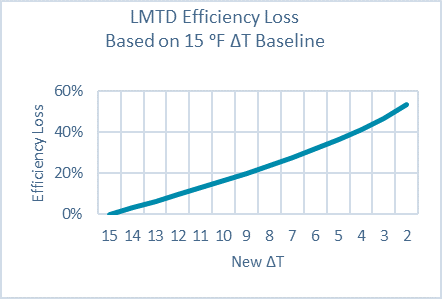 Using this formula, this graph depicts that as the difference in temperature decreases, the efficiency loss increases. At 15ᵒF ∆T (between incoming and outgoing temperatures), there is no loss of efficiency– the chiller works as designed. At 8ᵒF ∆T, however, there is a 24% loss in efficiency, which means that the chiller has to push 24% more water than expected to get the desired cooling effect. In partial load conditions, a loss of efficiency is typical. For example, a 50-ton CRAH unit operating at 30 tons with a 15ᵒF ∆T should use 48 gallons per minute (GPM) of chilled water. But since the ∆T often drops off under partial load, the cooling efficiency also drops, which means 48 GPM won’t be enough. A drop to 8ᵒF ∆T means you’ll need 24% more water (or about 60 GPM) because the temperature difference is not as great, so the heat transfer is less efficient. So, why did increasing the flow make matters worse for Bob? Since the lower temperature difference reduces efficiency and requires more water flow, when you increase the flow past the design point the ∆T drops, the heat exchanger efficiency drops, and you have to pump even more water to get the cooling effect you’re looking for. This efficiency loss occurs at both heat exchangers – the chillers and the air handlers. P&D’s mechanical efficiency experts were on the case. The first thing we saw was that the ∆T was low, which was a big clue that something was rotten in Denmark. So, to rule out potential causes and pinpoint the issue, we thoroughly evaluated pumps, chillers, AHUs, BMS, etc. to make sure they were each working properly, and that they could, in fact, work together properly as a system. Then we got down to the business of figuring out if chiller efficiency could be improved to handle capacity demands with the existing equipment. This is challenging because there is a peak efficiency curve for each piece of equipment, but there’s also a separate curve for the system as a whole, and as you make changes (i.e. flow rate), all of the curves are affected, so the formula is constantly changing as we’re trying to figure it out. It’s the mental equivalent of juggling while riding a bicycle. Backwards. Fortunately for Bob, we were able to reduce the chilled-water flow rates so the system could operate at more ideal temperature differences, and the 2500-ton load could be served efficiently with the original three chillers, returning the fourth to its role as a spare. We also automated the optimization process so that it updates itself continuously. Needless to say, Bob was happy to avoid a $3 million hit. And he was even happier that his utility monthly utility bill went down – an 8% drop in his monthly bill or about $240,000 in annual utility savings.